I used to enjoy trips to a nail salon until my favorite one closed almost 10 years ago. Since then, I have been searching for a new happy place and failed. So I learned how to take care of my nails. I have been cleaning my own nails since I started painting nail art. But, from time to time, I still visit nail salons in hope that I'll find a good one I can regularly go back to. It's different when a professional does it for you, right? There are so many nail salons here in Manila and believe me, I have tried a lot of them. In the end, I get disappointed with the quality of service. There came a point that I only get a foot spa and pedicure. It has been a long time since I let anyone polish my nails. Some people may say that I have high expectations. Before, I used to think that I do. But then again, as a client, aren't we entitled to get quality service for our money? And so, I'm writing this article to share my thoughts and to start a good discussion wherein we share our nail salon experiences. Hopefully, this written piece can be a learning tool as well for salon owners and clients alike. First and foremost, this is a service industry. 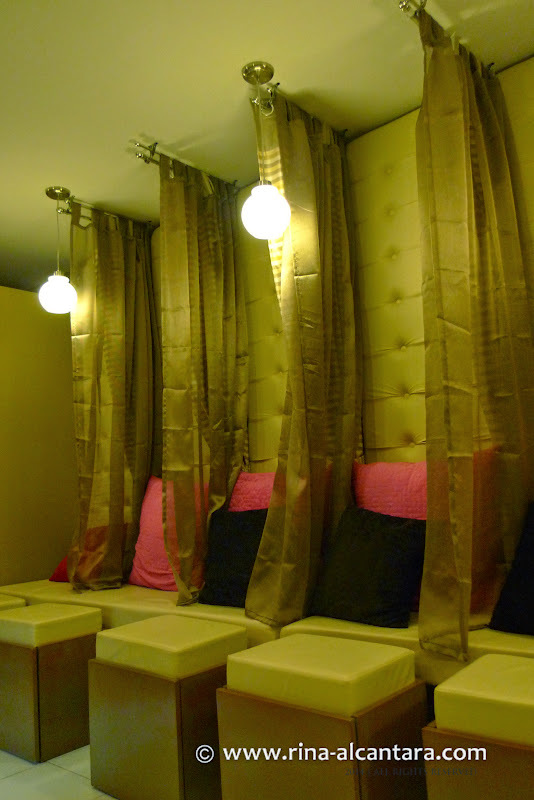 I have come across many nail salons that has a very nice atmosphere, but take in poor service. I am not saying that the look and feel of a salon is not important. What I would like to point out is that it is NOT about how the place looks, it is about the service. Clients come in primarily to get quality service and not to sit on a very comfortable couch. The latter comes as a bonus. This is a setup from one of the nail salons I previously reviewed. Crowded room between clients and almost no place for nail instruments. 2. Professional nail technicians with correct training. Knows that nails should only be filed in one direction. There have been countless times wherein my nails were filed rigorously back and forth as if there's no tomorrow. For brittle nails like mine, that is really bad. Knows by the heart the different nail shapes. If a client says squoval, it should be squoval and not any other shape. In many instances, I have asked a square shape and end up with round. It came to a point that I don't allow nail technicians to shape my nails. I do it myself instead. Knows how to correctly apply nail polish. It seems that nail technicians here automatically applies 2 coats of nail polish regardless of its opacity on the nails. There are nail lacquers that require more than 2 coats for complete coverage. I have been a victim of this many times over. I've also encountered nail techs that do not apply polish evenly. They apply the first layer just right and applies the second coat haphazardly. This becomes really obvious when you use a self-leveling top coat. Polishes applied unevenly is very unsightly especially under the light. Nail technicians should also know how to cap the free edge for a longer lasting manicures. I seldom see this being practiced in nail salons I've been to here in the metro. Also, they should be remove excess oils and lotions on the nails before polish application. I often experience nail techs who carelessly neglects prepping the nails after cleaning it. This is a contributing factor why manicures chip easily. Lastly, nail techs should know how to apply polish neatly and that polish should never touch the cuticle area. Bad manicures makes me sad so I remove polishes almost instantly the moment I get home when they are not neatly done. Invest to have your own set of base coat, top coat, and nail polishes for hygienic purposes. This would also ensure that the polishes used on your nails are clean, meaning that they were not used on other people. 3. 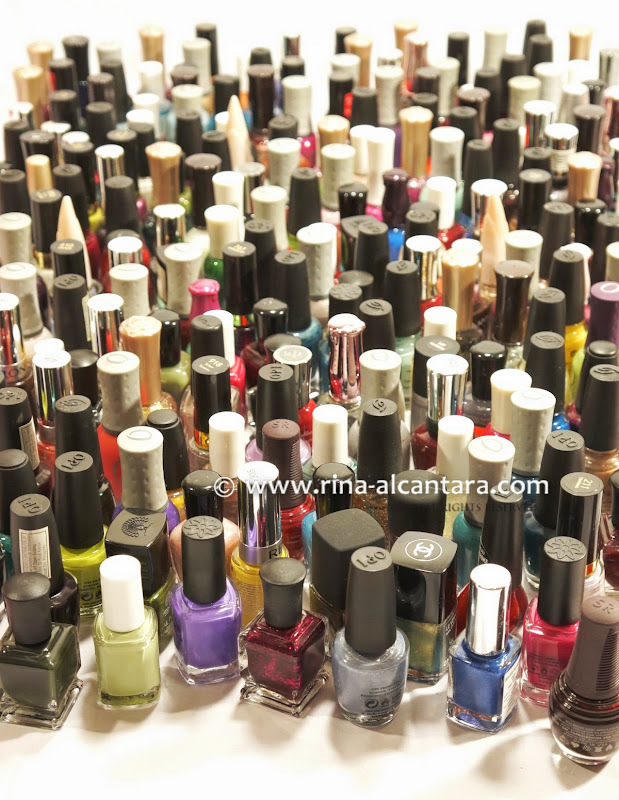 Has a good selection of nail lacquers. A nail salon with only a few selections of nail polishes looks depressing for me. I always like to be greeted with a good display of colors on a well-lighted shelve. I think nail salons should make the polishes an attraction by being creative on how they present these bottles. Perhaps a catalog of swatches is a better idea than just seeing the colors on an acrylic palette. I don't like choosing from a basket because you don't get to see the colors unless you lift every bottle. I'd also like to include here that I hope nail salons would invest in a good set of base and fast-drying top coat. A good base coat is easily taken for granted but is essential to protect natural nails. And there is already a good variety of fast-drying top coat in the market that nail salons can buy in wholesale prices to offer their clients instead of using a nail dryer. My nail polish stash 2 years ago. 4. Do not charge extra for nail polish application. This is a common practice here in the Philippines. Is it also being practiced elsewhere around the globe? I personally find this absurd. Isn't polish application part of a manicure/pedicure service unless the client chooses not to? Why charge extra for polish on top of any nail care treatment? I could probably understand an extra charge for a posh brand of nail polish. 5. Do not rush to complete a service. People come into a nail salon to be pampered. If a client asks for a spa treatment, he/she understands that this service takes time. So please do not rush to finish our treatment. It defeats the purpose of our visit. Take my case for instance, when I ask for a spa pedicure, I expect the massage to last at least 10 minutes and not a lousy 2 minutes on each leg. That would make the spa treatment very unsatisfying. I would have just gotten a pedicure if I didn't like the extra perks that comes with the spa. 6. Have enough nail technicians. I have walked into a nail salon several times and was denied service regardless if there were many vacant seats. The main reason is that they lack nail technicians. I would understand this if the place is at its capacity. But if a nail salon can sit 10 clients, then it should have enough nail technicians to accommodate 10 clients simultaneously. This sad state discourages people from coming back because it's either they are anticipating the problem or that it gives a bad impression on the salon itself. 7. Appointments should be honored. Time is gold. This is probably the main reason why most people want to book appointments ahead of time. We just don't want to waste time waiting. Unfortunately, some nail salons prioritize walk-ins regardless if there would be an overlap in scheduled appointments. Unless a client who booked an appointment is more than the required allotted time for being late, his/her slot should not be given to another. That is just very unprofessional. Hygiene is one of the many concerns of a client in choosing a nail salon. It should be well-organized and clean. Tools should be sterilized in between customers. And these implements should only be opened in front of a client. I applaud nail salons that practice sterilization. Towels used should always be newly washed for every customer. I have encountered 2 nail salons here that does this. And of course, some tools should be used only once like nail files, toe separators, and buffers. Hygiene is also the main reason why I don't like the nail brushes because it is difficult to know whether or not it was cleaned properly before my service. My Personal nail care and art instruments. Further, all chemicals used during a service should be properly labeled. I know that nail salon owners buy supplies in bulk and transfer them to smaller containers. This is very true for nail polish removers, base and top coats, lotions, cuticle softeners, scrubs, etc. However, we (the clients) have the right to know what you are using. Sometimes, I ask what is being used on my service. Especially on foot spas which are categorized based on treatments, it is important for clients to know what is it you are applying on our skin. Bring your own set of tools. But some nail technicians prefer to use instruments that they are already accustomed to and that is very understandable. Just make sure the implements are sterilized. But you can insist using your own nail files, buffers, and toe separators because these tools are hard to sanitize. Infections that we can get from using common tools should always be taken seriously. There are some nails salons that have dimmed lights. I think they are mistaking a nail salon to a massage parlor. Seriously, how can a nail technician work well in poor lighting? Some compensate by having a separate stand lamp and although it is a good fix, a well-lighted nail salon is still highly recommended. I've been to nail salons where lamps are even placed in between my legs during a pedicure. In that scenario, I have to be extra careful not to move my legs wrongly as to not topple over the lamp. This is another nail salon I was able to review before. 10. There should be a table setup for manicures and nail art. More nail salons are offering nail art and I think it's a good thing. However, salons here do not have a proper setup for a good manicure or nail art painting. Often, nail technicians do nail art while the client is on a lounge chair. Although it is comfortable, it is the suitable setup for a manicure or nail art. Nail art requires some tools like brushes, paints, palettes, etc. This means that a table is in order. And I am sure that most will agree that a table will give the nail tech a better control of your hands when painting your nails. I think nail salons here underestimates the fact that there are women who would only come in for a manicure. I know, I would. My favorite nail salon that closed had tables for manicures and I really think it should set an example to other nail salons. I would be sharing nail salon reviews and I'd be referring to this article. I am still searching for that nail salon that I always look forward to visiting. If you know a place, please tell me. I would love to visit that nail salon. If you also want me to do a review on a particular nail salon, send me a message and I'll see what I can do. Please share with me your thoughts and let's exchange ideas on the matter.